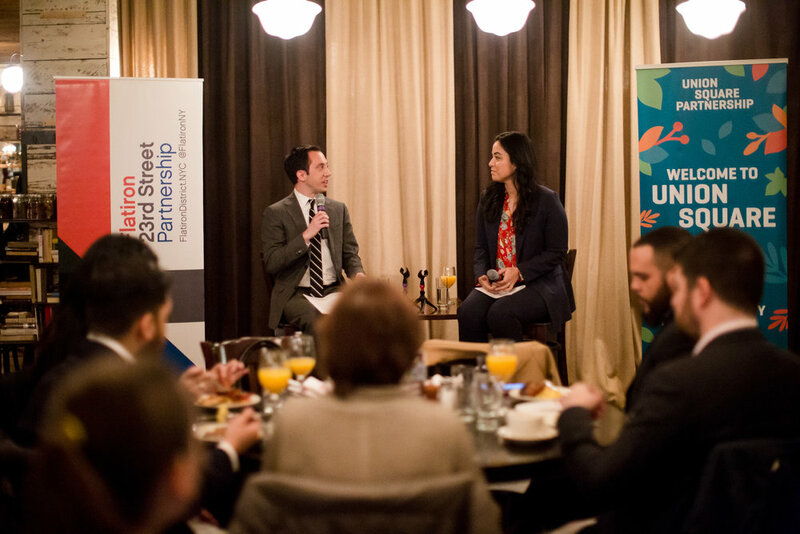 Joined by local business and constituents, New York City Councilmember Carlina Rivera was the honored guest at a breakfast forum hosted jointly by the Union Square Partnership and the Flatiron/23rd Street Partnership on Thursday, March 29th. The morning event held at Almond Restaurant opened with remarks from Jennifer E. Falk, Executive Director of the Union Square Partnership, and Jennifer Brown, Executive Director of the Flatiron/23rd Street Partnership, and featured a discussion and Q&A session conducted by Michael Scotto of Spectrum News NY1 using crowd sourced questions from attendees. Community members also had the opportunity to ask questions and learn about local initiatives directly from the Councilmember. Councilmember Rivera addressed various community concerns, including support for small businesses. The majority of businesses within the Union Square and Flatiron neighborhoods are small, locally owned enterprises that form the backbone of our communities. Hon. Rivera highlighted the role the city can play through zoning and legislation to help small businesses succeed. Additionally, she highlighted ways the City can improve existing programs by better marketing services to help small businesses better compete in a time when most people are shopping digitally. On the impending L train closure and its impact on local residents, workers and businesses, the Councilmember continues to meet with the Metropolitan Transportation Authority (MTA) and the NYC Department of Transportation to reduce congestion in the Union Square + Flatiron neighborhoods caused by the shutdown and the mitigation plan. Of top concern for Hon. Rivera's office is the mitigation's plan to use mostly diesel buses along the commercial corridor. With the MTA planning to run a bus every minute, the exhaust will impact air quality and further negatively affect the health and quality of life of residents and businesses. On the discussion about the Mayor's planned Union Square Tech Training Center, Councilmember Rivera expressed support for sharing the prosperity of the tech economy with a broader spectrum of residents. Pointing out the tech industry's lackluster ability to hire, train, and retain a diverse workforce, the Councilmember explained the new center could combat this problem and is working with local stakeholders to ensure jobs, affordability and the character of our unique neighborhoods are a priority. Finally, as co-chair of the Women's Caucus, Councilmember Rivera shared her efforts to-date to increase gender diversity in the New York City Council. Her stated goal is to increase the number of women representing New Yorkers to 21 by the year 2021. She emphasized her commitment to meet, identify and mentor women to make it happen. 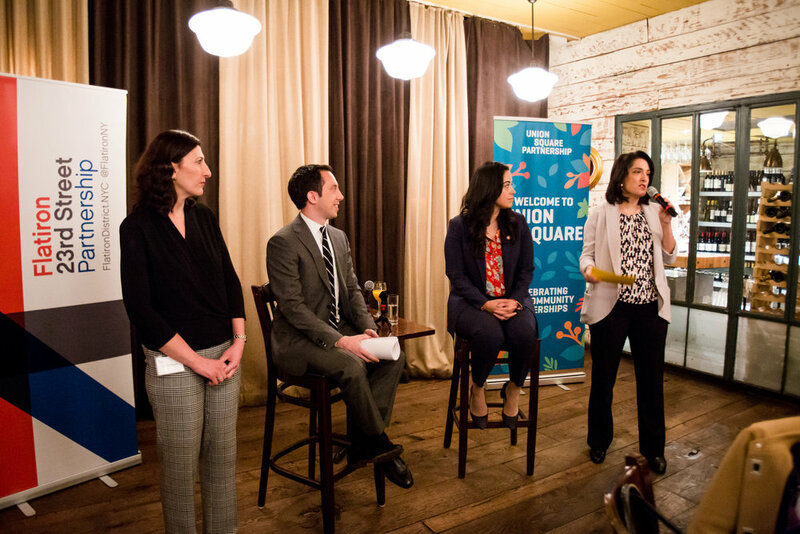 "Meeting with various stakeholders of Council District 2 - residents, small businesses owners, and people who work here - is one of the best parts of being an elected official," said NYC Councilwoman Carlina Rivera. "I was excited to join the Union Square Partnership and the Flatiron/23rd Street Partnership for a broad and diverse discussion on street safety, supporting small businesses, and how we can work together to improve our quality of life." To stay in touch with Councilmember Rivera, follow her on Twitter @CarlinaRivera (where she encourages you to send her a Direct Message! ), email her, or call her office at 212-677-1077. Learn more at carlinarivera.nyc.